Coming back here, Tom noticed a sudden temperature rise and everyone in the Subie (I wasn't with them on this excursion) smelled hot coolant. The top radiator hose had "blown" - we later discovered that the thermostat was faulty, no way to tell what came first. The bottom line: after investigating and finding oil and coolant mixed in the engine, our trusted mechanics at Professional Auto said we would need a replacement engine unless we wanted to scrap the car! What to do? First; calculate the cost of replacement with (1) a new engine from Subaru, (2) a rebuilt engine from Jasper or someone else, (3) an engine from a wreck (a "junkyard engine") and compare this to the value of a replacement used car costing as much as the selected option. 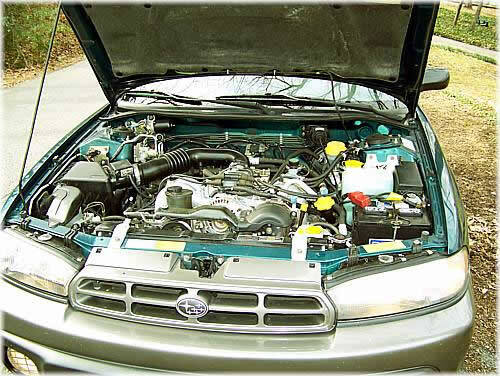 If you are not a Subaru afficianado you will not know that this is the only model year with the DOHC engine having hydraulic valve lifters; in 1997 and onwards the engines have mechanically adjusted lifters and oddly enough, the engine cannot be interchanged. For reasons beyond my comprehension, Subaru decided that since there was such little demand for the '96 engines they must be highly valuable and therefore they want nearly $6,000 for one. I suppose that some accountant calculated the cost of each engine and divided that by the number of engines available; at that rate, the last of these engines will stay in Subaru's warehouse with a price tag of several millions of dollars. Jasper Engine Rebuilders (whom I respect and trust) wanted about $4,800 for an engine with a 3-year, 300,000 mile warranty. A junkyard engine of unknown pedigree was quoted at $3,800. For the difference, we were about to go with the Jasper since the total of about $7,000 would not buy a decent used car with any guarantee that it wasn't going to die soon. Other than the engine issue the Subie was in very good condition, and we had just outfitted it with a tow-hitch to pull our "scooter traiiler." Then, on Tuesday, May 5, I was inspired (literally, I believe, by good St. Jude Thaddeus, cousin of Jesus and patron of our home parish here in Chattanooga, known as "patron of impossible problems") to search the WWW for sources of engines. There I found (actually re-discovered) Colorado Component Rebuilders in Denver, Colorado. Their Website showed a spring special of $300 off and an emaiil and call found we could get a completely remanufactured engine for $3,000 delivered to the shop here in Chattanooga -- a saving of about $1,800 over Jasper's price. It was not 11:00 here in Chattanooga - the shop had not yet sent a check to Jasper so they canceled that order at my request; I called CCR and gave them the credit card data so they could start on an engine for us. Watch here for photos and a progress report as the engine arrives and is installed. © 2008 W. J. Laudeman. All rights reserved.